Radio Exterior de España leaving shortwave? Not yet. This week, Radio Exterior de España (REE) suddenly dropped many of their analog shortwave broadcasts. I waited to mention this on the SWLing Post because, even though they were no longer on the air, I had heard no rumors beforehand and I had recently been in contact with them. SWLer, Mark Coady, made a post on Facebook today with a message from REE stating that there was a lot of internal confusion and frustration regarding REE suddenly dropping shortwave services. They also mentioned that REE is planning to restore shortwave services again, possibly as soon as this weekend. I just received a short message from an REE contact to the same effect. So, we will see if they restore services this weekend or early next week. I personally enjoy listening to REE’s services in English and French. I especially love their music, when they play it. If you’re an REE fan, I suggest you contact them ASAP (ree@rtve.es) and show your support. Though services are being re-established, shortwave broadcasts may be on the chopping block again in the near future. This entry was posted in Broadcasters, News and tagged Radio Exterior de Espana, REE, Shortwave Radio on November 30, 2012 by Thomas. WRTH has announced that their 2013 edition is now available online. Every year, I look forward to searching a new WRTH’s pages for the first time. What is the WRTH (World Radio and TV Handbook)? Click here to read my reviews of the 2010, 2011 and 2012 editions of WRTH. In the 2010 edition, I even include an interview with the publisher, Nicholas Hardyman. To order your copy of WRTH 2013, go to this page on WRTH’s website. This entry was posted in Articles, News, Schedules, Schedules and Frequencies, Shortwave Radio and tagged Alternatives to Passport to World Band Radio, Passband.com, Passport To World Band Radio, Shortwave Schedules, SWLing.com, World Radio and TV Handbook, WRTH, WRTH 2013 on November 30, 2012 by Thomas. 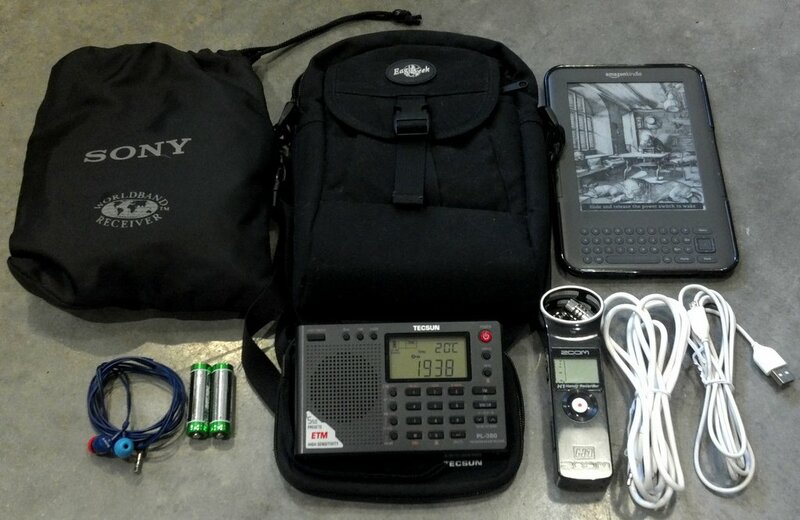 Though I only travel with one carry on bag, it doesn’t mean I can’t accommodates my shortwave radio/recording pack. Having just returned from nearly three full weeks of traveling, I’m more convinced than ever that my just-one carry-on bag approach makes absolute sense. In one bag, I’m able to take everything I need, including casual and business attire, toiletries, first aid and, yes, of course, my portable shortwave radio (never leave home without it!) and my Zoom H1 recorder. Years ago, while working for a fiber optics company in Europe, I learned the trick to keeping my cool during frequent air travel was simply to avoid, at all costs, checking in baggage. Over the course of several years, I honed the contents of my travel bag down to the bare essentials, and even for longer trips in developed countries, made the (correct) assumption that any supplies I required could be found at my destination. My circa 1999 Eagle Creek convertible laptop bag has traveled thousands of miles. It’s just big enough to accommodate everything I need for several days or even weeks travelling. 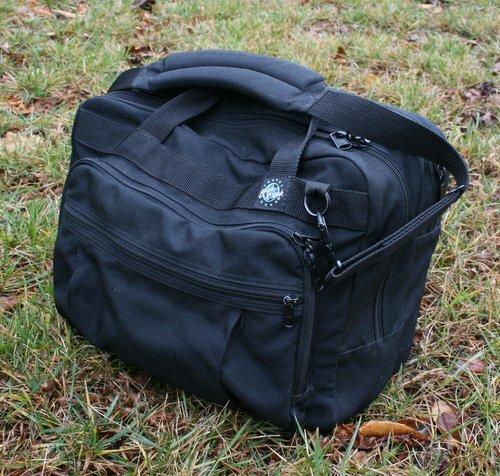 For twelve years now, I have been using one of three Eagle Creek carry-on convertible bags. Two of these plain black bags look much like the ubiquitous vertical rolling luggage you see every day in major airports, but they hide two secrets: each can be converted into a full-fledged backpack, and each meets the most stringent standards for carry-on luggage. They’re also built to take a beating, which they’re getting, and have a lifetime warranty. The third Eagle Creek pack is basically a roomy laptop (and radio) bag (see photo on left). 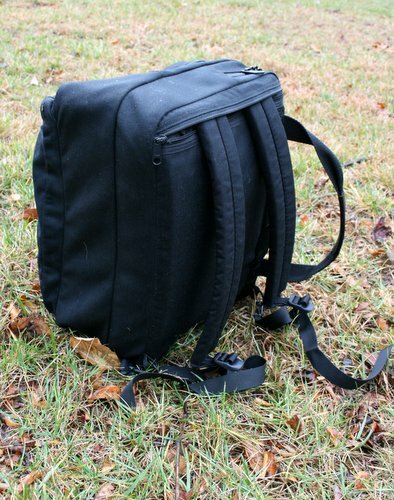 It has no wheels, and can be worn with a shoulder strap…or, again, converted into a simple two-strap backpack. When traveling alone, I can easily get by with only the third and smallest of my Eagle Creek pack: the laptop bag. It has a very roomy, padded compartment for my laptop, a middle compartment where I fit my bundled clothes, first aid, and radio pack (which also holds my Kindle), and a front section with organizers for office supplies and a convenient place to stash my travel docs and passport. It’s also a very simple to make this pack virtually pickpocket-proof. This laptop bag quickly converts into a backpack–a useful feature when it’s fully loaded and you need both arms free. The benefit of using this particular Eagle Creek laptop bag (important: the one without wheels) is that–even if I’m being loaded in the last zone of a flight, even if the flight is fully booked, and even if the flight is on a De Havilland Dash 8-100–I always find a place for my bag on board, and never, ever, have to gate-check my bag. It will fit in a small overhead compartment, or at the very least, under the seat in front of me. Though the compromise is that I travel light, the great benefit is that I never have lost any bags, rarely miss a connecting flight (it typically takes at least five extra minutes to claim even a gate-checked bag), and I zoom in an out of an airport. I have the luxury of sitting back and reading while I watch others panic at a gate, waiting for their appropriate “zone” to load. From my seat, I watched US Air load wheeled carry-on luggage that they required some unfortunate passengers (who were already on the plane!) to check in. Over the past decade, air travel has really changed. Most of the domestic flights I took throughout Europe a decade ago used to be only about two-thirds full. Here in the US, it appeared to be roughly the same. Today, however, airlines have cut back their offerings and frequently overbook flights. In fact, on a recent flight returning from Denver International Airport, the airline warned of penalty charges if passengers attempted to carry on more luggage or weight than allowed. 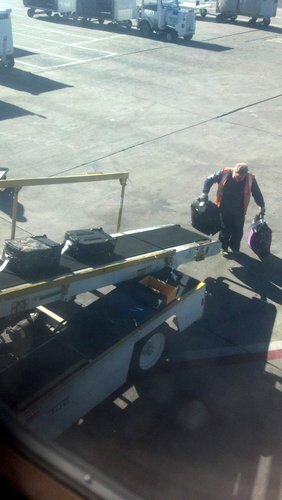 The airline was making anyone with a wheeled bag–no matter how small–check it in. Since I was in the eighth row seat, and I only had my Eagle Creek laptop bag on a shoulder strap, I waited until almost everyone else had boarded before I got in line. I walked straight into the 737, pulled my radio pack out of my laptop bag, stowed the laptop bag in the overhead compartment, and settled into my seat. No sweat. Meanwhile flight attendants were taking extra baggage from travelers in the back of the plane and checking in their luggage on the spot. Though their bags met overhead compartment criteria, there simply wasn’t enough room. Confession time: So, I am something of a pack addict…! My wife recently pointed out that, besides radios, I have too many packs. I’m convinced I do this because I’m always searching for the best, most versatile way to travel. Most of the packs I buy these days are smaller ones to compliment my Eagle Creek packs. I’m a choosy pack connoisseur, too: I often save my dollars and seek something made in the US–or in Europe, Australia or South Africa (true of pack-maker Karrimore, at one point). I don’t typically like the mass-produced stuff, which I find is not as well-made. My original three Eagle Creek packs were made in the USA, but after the company was featured on the American TV talk show Oprah, receiving the host’s endorsement, the unfortunate result is that the company’s products have since (in my opinion) been compromised and manufacturing moved overseas, likely to keep up with new demand. 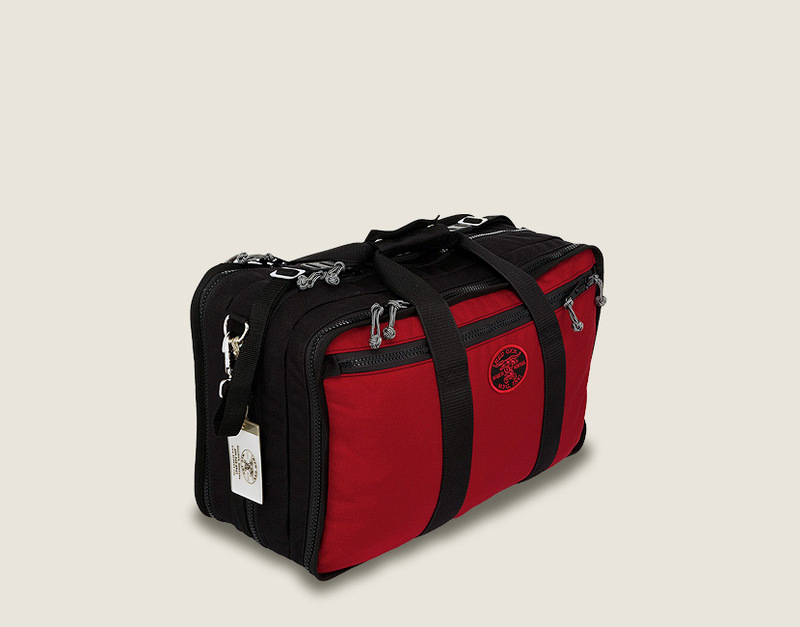 Red Oxx actually designed their Air Boss bag for one-bag travelers like me. It even meets the strictest international carry-on standards. Since a good friend just sang US company RedOxx’s praises, I’m currently drooling over the RedOxx’s Air Boss and SkyTrain. Both look like they would do the trick, but make me slightly nervous because they are a couple of inches larger than my trusty-if-“rusty” Eagle Creek laptop bag, in two dimensions. If RedOxx’s uber-affordable Extra Small Aviator Bag had a shoulder strap and could accommodate a small laptop, I would even consider trying that bag–perhaps in combo with their Gator Carry-On Bag, this would make sense (but that would make for two bags, not sure about that). 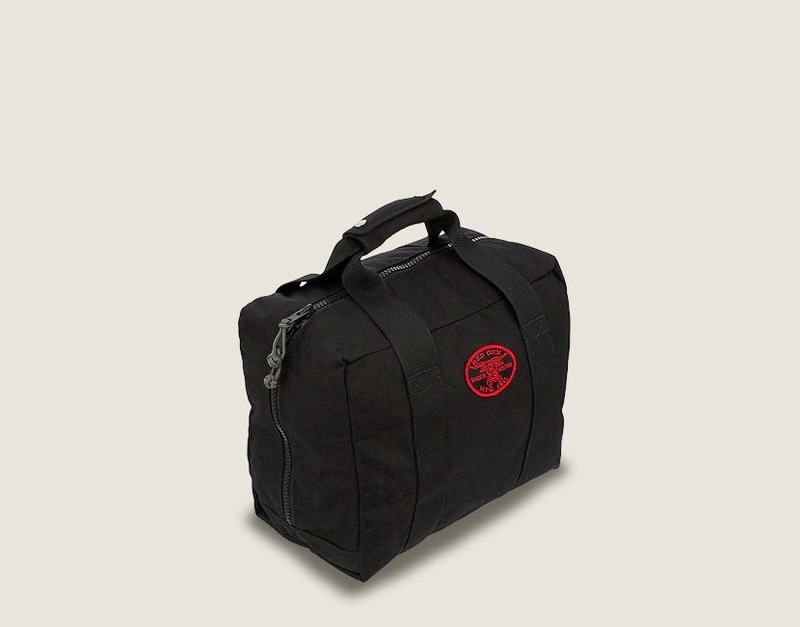 Could I fit all of my stuff in the Red Oxx extra small aviator bag? T’would be a challenge! I suppose I could also consider the US company Tom Bihn Tri-Star, though it is probably more bag than I really need. Note that although these bags are pricey, all come with a no-hassle, no-questions-asked, lifetime warranty–the Redd Oxx warranty, in particular, is worth a read–both companies are also noted for excellent customer service and the bags should last my lifetime. Unless, that is, I find another that I want to test drive. Filled with of radio gear, of course. Ah, well…My wife appears to be right. I suppose the reason I’m entertaining this slightly off-topic travel subject is not just due to my recent travel, but because I’m now enlightened enough to realize that traveling light never means traveling without a radio. With some careful planning and packing, choosing the right bag–and travel-companion radio–the whole world is waiting for you. And you won’t find yourself spending your travel time–and radio listening time!–watching bulky suitcases drift round on the conveyor belt at baggage claim, as you wait for yours. Anyone else out there have a similar bag addiction? Got one you like? Radio travelers, share your thoughts! This entry was posted in Articles, Shortwave Radio, Slightly Off Topic, Travel and tagged Carry-On Luggage, Eagle Creek, One Bag Travel, Red Oxx, Red Oxx Air Boss, Red Oxx Extra Small Aviator Bag, Red Oxx Sky Train, Tom Bihn Tri-Star, Travel on November 27, 2012 by Thomas. This news story about a recently discovered WWII carrier pigeon message has been floating around the Internet over the past few days. Not even the British spy agencies that inspired James Bond can solve the mystery of a secret World War II message recently found on the skeleton of a carrier pigeon in a house chimney. The meaning of the encoded message apparently died about 70 years ago with the wayward pigeon that David Martin found in his smokestack in Bletchingley, Surrey County, England. Martin recently discovered the bird’s remains with the surprisingly intact message inside a small red canister attached to a leg bone. […]Hand-written on a small piece of paper labeled “Pigeon Service,” the note consists of five-letter words. Those words don’t make sense: The jumble begins with “AOAKN” and “HVPKD.” In all, the message consists of 27 five-letter code groups. Indeed, the only hope the UK intelligence agency, the GCHQ, stands in deciphering the message (click here to see the full message) would be to find the appropriate, specific decipher key. Most likely, this message–like numbers station (a.k.a. 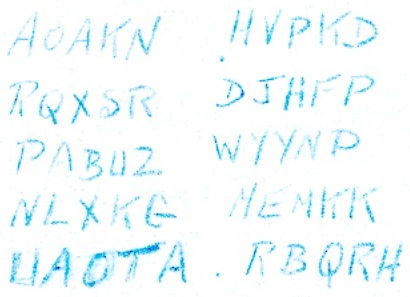 spy numbers) messages–was a one-time communiqué, with a one-time decipher key. This type of encryption is incredibly effective as they provide little to no context for deciphering. But again, that’s a part of the magic and mystery many of us find so fascinating about numbers stations. The messages are (still) everywhere and broadcast publicly, yet, we have no clue of the meaning. This entry was posted in News, Numbers Stations, Radio History, Shortwave Radio, What's On Shortwave and tagged 5 Word Codes, Archive.org, CNN, Conet Project, GCHQ, Numbers Station, Numbers Stations, Spy Numbers, The English Man Numbers Station, WWII Carrier Pigeon Message on November 26, 2012 by Thomas. Thanks to Paul Thurst on the blog Engineering Radio, I discovered this excellent video of the engineering staff of ABC (Radio Australia) servicing some of their HF antennas and transmitters. Having visited several shortwave transmission sites myself, I truly appreciate this peek inside Radio Australia. Do any of you know which Radio Australia site this is? I’m curious if it is Shepparton. Please comment! This entry was posted in Broadcasters, Videos and tagged ABC Radio, Radio Australia, Radio Australia TRansmitter site, Videos on November 26, 2012 by Thomas.